Evolutionary Human Sciences is a fully Open Access journal that supports a unified approach to evolutionary human sciences. We are concerned with understanding how evolution has shaped humankind, from biology through to culture. The journal aims to attract papers in the fields of evolutionary anthropology, cultural evolution, human biology, evolutionary medicine, anthropological genetics, phylogenetics, paleoanthropology and evolutionary approaches to psychology, cognition, language, economics, archaeology, primatology, politics and anything else that can be considered to be part of the evolutionary human sciences. 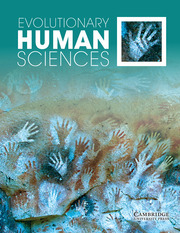 Evolutionary Human Sciences publishes interdisciplinary original research, including registered reports, and reviews.